Several factors can contribute to allowing your aging adult to keep herself as active as she wants to be while still being as safe as she can possibly be. Some of these tips might even help her to become more active. Encourage Her to Get Plenty of Sleep. When your elderly family member isn’t getting enough sleep, she’s more likely to be wobbly or otherwise less stable on her feet. It may also exacerbate any side effects that she normally wouldn’t feel from her medications. If she’s having a great deal of trouble sleeping, talk to her doctor about possible solutions. Do Regular Medication Reviews with Her Doctor. Speaking of her doctor, while you’re there, do a medication review. This is basically a session in which your senior’s doctor takes a closer look at her medications and how they might be interacting. If you’re noticing any new symptoms or side effects, they could be due to medications. Alcohol in moderation isn’t necessarily a bad thing, but even tiny amounts can make your elderly family member less stable on her feet. It might be worth it to cut back to occasional drinks only. Keep in mind also that alcohol can lower your senior’s inhibitions and can increase side effects from medications. What your elderly family member wears on her feet is absolutely crucial to helping her to stay active and to stay safe. She needs flat-footed shoes with rubberized soles that help her to maintain her footing. She should have her feet measured if it’s been a while because feet can change sizes over time. Schedule Regular Hearing and Vision Tests. Hearing and balance are closely related, although you might not think about that much. Vision changes can also be difficult for your elderly family member to manage, especially if she’s not aware that she’s experiencing some trouble with her vision. Regular testing of both can help you and your senior to spot changes before they affect her ability to remain active. Remind Your Senior to Take Her Time Standing and to Use Tools When She Needs Them. When your senior sits or lies down for longer than a few minutes, she needs to take her time getting back up. Getting up too quickly doesn’t give your senior’s blood pressure or balance time to recover and she could find herself in a bad situation very quickly. Taking an extra few minutes getting up is worth avoiding a fall. 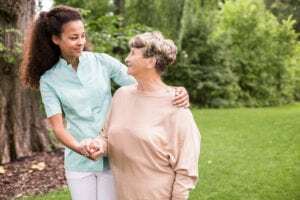 Something else that you might want to consider is hiring home care providers to give your aging family member an extra hand at home. She can conserve energy when they’re doing more of the heavy lifting and you’ll have greater peace of mind. If you or someone you know needs help with home care in Ada, MI, contact Gauthier Family Home Care. We provide quality and affordable home care services in our community. Call us at (616) 258-2300 for more information.